Posted by aquillam in Astronomy, Science. 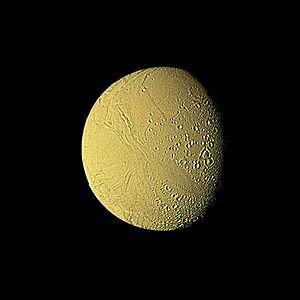 On August 28 in 1789, William Herschel turn his mammoth 48-inch telescope on the planet Saturn, and identified a new moon, latter to be called Enceladus. 19th and early 20th century spectroscopic observations identified water on or near the surface of the moon, but very little else wan know about it until the Voyager and Pioneer 11 flybys on the mid 1980s. These showed a bright, icy surface with a mix of moderate cratering and almost no cratering, showing the moon was still geologically active in some regions. At that time, there was no known mechanism for geologic activity on such a cold object. The Voyager I observations also lead to the hypothesis that Saturn’s E ring was actually formed of material vented by this moon, but the Voyager II observations were not good enough to confirm this. Skip forward 20 years to 2005, and NASA’s Cassini mission’s first encounter with the moon. A lot of questions were answered in those first few flybys, and a whole lot more raised. 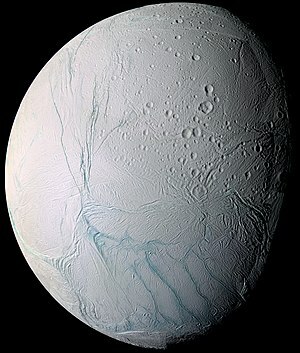 Titan may be the largest moon, and the only one with an atmosphere, but is some planetary scientist’s books, Enceladus is the most interesting! Cassini quickly confirmed the E ring material was ejected from some very active geysers on the younger, southern side (yep, it has a young side and an old side, like a lot of moons, and even Mars). The southern hemisphere is lined with “tiger stripes” (the blue lines in the image at left) that are much warmer, hinting at cryovolcanism. They also appear to contain organic material, leading some scientists to speculate on the potential habitability of the moon. Posted by aquillam in Uncategorized. Now for something completely different (really, you’ll probably find the Liberty Bell March in here somewhere.) I stumbled across this looking for something else and ended up spending an hour here. Posted by aquillam in Astronomy, MichiganAstro, Science. On September 23, 1846, the planet Neptune was observed and recognized as a planet for the very first time. This month, it will complete it’s first orbit since its discovery. That’s right. Neptune is so far away from the Sun that it takes longer than any human’s lifetime to complete one orbit. That’s very, very far away. Neptune’s discovery is also an interesting story, and one that really shows just how human Science really is. Galileo observed it several times, but since it always appeared to be in the same position, he thought it was a star. I’m sure many other astronomers also observed it and thought the same thing. Part of that was surely because they weren’t prepared for there to be more than 5 planets. Sometimes, discoveries are missed because scientists aren’t prepared for the discovery, so it goes unrecognized. Then in 1781, Herschel discovered Uranus, which was also observed by others but not recognized as a planet. Over the next 20 – 30 years, astronomers mapped its motions and generated tables of its positions. They soon realized its orbit did not perfectly obey Newton’s and Kepler’s laws based on what was already known. However, the variations could be explained if there was another massive planet even farther from the Sun. The first Planet X was born! Two mathematicians, Adams in Britain and Le Verrier in France used the variations in Uranus’ orbit to predict the location of an 8th planet out beyond Uranus. Adams published his data first, but observers in England showed little interest in taking up the chalenge of finding a dim dot among hundreds of dim dots. Le Verrier published his data, then immediately sent a letter to Galle, director of the Berlin Observatory, asking him to look for the planet. Thinking that astronomers in England would already be searching for it, Galle immediately took up the challenge. Meanwhile, back in England, the astronomer Royale, Airy, noticed the similarity between the two sets of predictions. He wrote to Challis at the Cambridge observatory, encouraging him to take up the search. On September 23, 1846, Galle identified object in his telescope as the planet Neptune, in a position very close to where Le Verrier predicted. He published his observation, along with an earlier star map that included Neptune. The two maps together showed Neptune’s change in position, showing it was definitely the planet Galle predicted, even if the position wasn’t perfect. After looking at Galle’s work, Challis realized that he had observed the planet earlier that year, but failed to recognize it, because it wasn’t exactly where Adams predicted it would be. Sometimes, even when you are prepared for a discovery, you miss it because the details aren’t perfect. And here is where it gets really interesting. France and England have always been a bit competitive. There was no doubt it was a French astronomer who discovered Neptune, but who predicted it first wasn’t as clear. The competition to be first was just made for the media, and newspapers on both sides took up the challenge to ensure that their countryman was the one who got credit for being first. The fight got downright vicious, with name calling and possible libel on both sides. To this day, people will argue over who got it right. Some credit Adams for publishing first. Others credit Le Verrier for being closer. Most people now credit both. But no matter which side you take, there’s no denying that the competition helped speed the discovery. The real irony to the vitriol is that the data on Uranus wasn’t really complete, so neither one of them really had a precise calculation. If Challis started observing a few months earlier, Adams’s prediction would have been much more accurate, and Challis probably would have recognized the planet. If Galle had waited a few months more, Le Verrier’s predictions would have been as bad as Adams’s predictions, and Galle might have missed the planet too. Because of the flaws in the data from Uranus, both sides depended a little on luck, and a little on open-mindedness to actually make the observation. But best of all (in my opinion) is this: because of the flaws in the data for Uranus, Neptune’s position couldn’t explain the discrepancies in the orbit of Uranus. This caused a new burst of activity, as mathematicians and astronomers sought to be the first to predict the new planet X. Posted by aquillam in Astronomy, Detroit Observatory, MichiganAstro. About midnight of Saturday last, Prof. WATSON bagged another planet, which he describes as shining like a star of the tenth magnitude, and situated at twilight Sunday morning in right ascension 358 degrees and 25 minutes; declination 48 minutes south; with an apparent motion west and north 34 seconds of time in right ascension, an four minutes of arc in declination. Prof. W. is driving business in the planet line, having discovered one on the 11th of July. Using a combination of Starry Night and an internet search (especially ADS), I believe this is the asteroid Helena. In case you’re wondering, in 1868 anything that moved relative to the stars was generally considered a planet. Ceres, now known as a dwarf planet, was considered a full fledged planet when it was discovered on January 1, 1801. By the 1850s, about a dozen of these small objects were known, and astronomers began using the word “asteroid” to describe them, rather like some planetary scientists started calling Pluto a dwarf planet, ice dwarf, or “trans-Neptunian Object” back in the 1970s. It was another 20 or so years before asteroid became the common name for such objects. There were several “planets” discovered at the Detroit Observatory during this period, despite the Michigan Weather. Check out this report from the Lick Observatory in 1943: http://adsabs.harvard.edu/full/1943LicOB..19..161H.